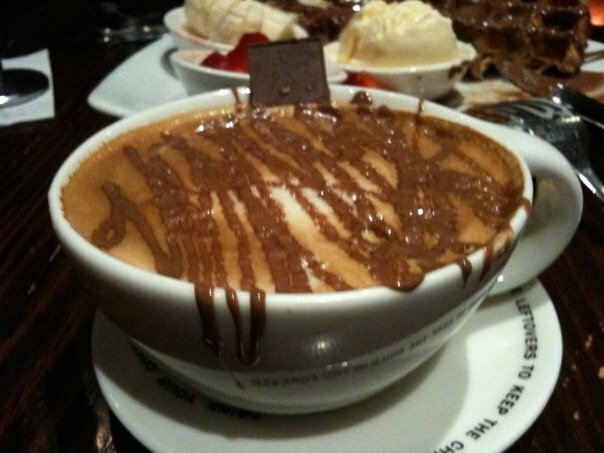 Max Brenner, Bondi Junction Westfield, Sydney. The thing I love the most about this Waffle is its customisability (Yaay! That’s actually a word). 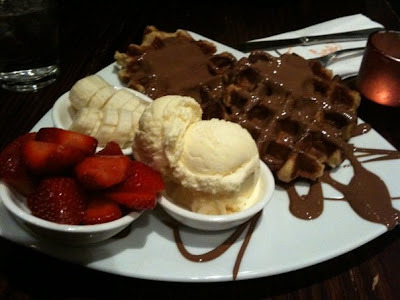 Whether you choose the all-in Tutti-Frutti Waffle – that’s 1 or 2 Waffles with 3 bowls of Strawberries, banana, and Vanilla Ice Cream – or just a single Belgian Waffle covered in warm milk chocolate. This waffle is the answer to all of your pains and sorrows. Dramas aside, the waffle is actually really crunchy on the outside and soft in the middle, creating a perfect combination with the chocolate. 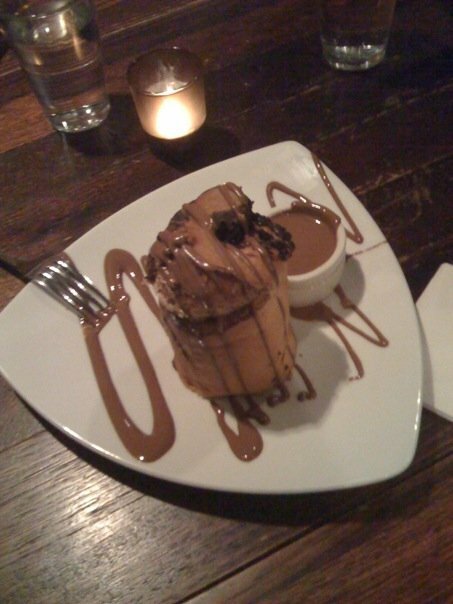 The ultimate self-indulgence dessert- if you decided to eat it yourself. The fondue has everything that you could ask for: two pots of heated dark and milk chocolate served with bowls of fresh strawberries, bananas, marshmallows and banana bread on top of a wooden tray with two dip sticks. Make sure you bring an extra tummy to share this with you, otherwise you might as well skip your whole meal tomorrow. Okay, seriously the top three dishes can be ordered according to the degree of enjoyment you want with the chocolate. This one was all about light and refreshing dessert. 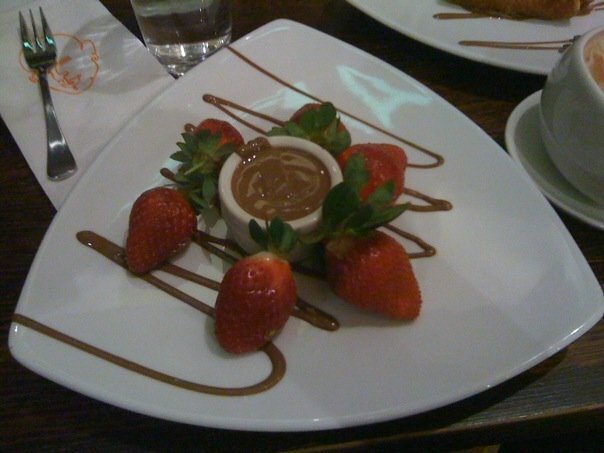 6 luscious strawberries arranged beautifully around a small pot of milk chocolate. These are not just ordinary strawberries! They were massive, juicy and taste very sweet. Originated from Poland or thereabouts, Babka is a very nice and soft spongy cake with cinnamon and chocolate fillings. The cake is also served with a small pot of milk chocolate. This cake is perfect as a lunchtime menu because of its muffin-size. 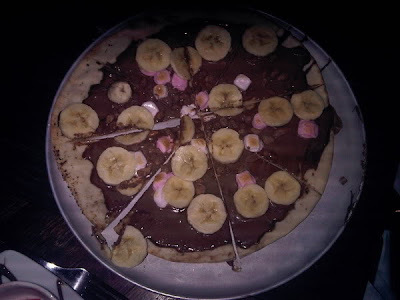 Last, but definitely not the least, is the no ordinary pizza. It’s a very unique pizza covered in milk chocolate then baked with all the yummi-ness on top of it. There are countless of drinks that you can enjoy, from hot to cold, and I’ve tried some of them and they’re all equally nice. 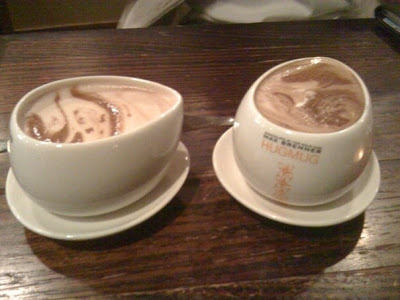 However, my all time favourites are still the very basic Milk Hot Chocolate and Café Latte. Served in a hug mug, the Chocolate gives us an extra kick to the already chocolate-y night. And if you need extra caffeine, then the Latte will do the job for you. 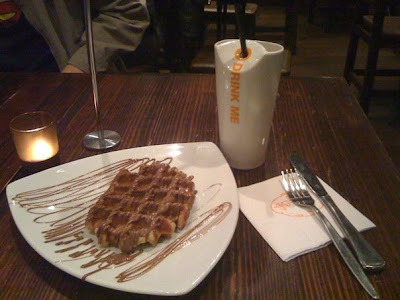 There was no Max Brenner in real life. 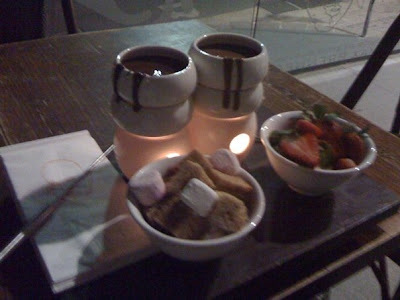 The shop was opened by guys name Max and Brenner. Max Brenner always open their shops in premium spots in Sydney, from the CBD to the posh Bondi Junction. I personally like to go to the Bondi Junction one for the whole going out experience, from dinner to movie to dessert; it’s all available in Bondi Junction. If you need to find something after midnight, you might as well go to Pancakes on The Rocks because that place open 24/7.